Honestly is there anything more satisfying than when the new skincare products you ordered online arrive at your door? I don't think so. It's been a long time coming, after several DMs on Instagram, tweets, text messages, in-person inquiries... (you get it), I am finally sharing with you my skincare routine. Although I don't see my daily skincare routine as anything particularly accurate or special, I do love what I use and how the products work for my face therefore wanted to share with you all. I'm heavily influenced and mesmerized with Korean beauty/skincare and I think that's where my obsession *cough cough* I mean journey to finding skincare that works for me arose. So without further ado, here's my skincare routine, a collection of tried + true products that I love to use on my face/body everyday. *Kendrick Voice* "Wake up drank..."* Drinking water is definitely a must when it comes to maintaining clear skin. Mind you there are days when I'm not so committed to drinking my daily 8oz, however the first step to outward beauty is inner beauty and that's maintaining full hydration on a daily basis. I like to do the double-cleanse method by which I mean an Oil cleanser and a Water-Based cleanser. Even I don't wear the most makeup on a daily basis, having a thoroughly clean face always just feels so good at the end of the day and after waking up. Favorites: Clinique Take-Off Makeup Remover, Glossier Milky Jelly Cleanser, Mario Badescu Enzyme Cleansing Gel, NeoGen Real Fresh Cleansing Stick, Alder New York Everyday Face Cleanser and Kiehl's Ultra Facial Cleanser. Why I love: I really love gentle cleansers because my skin is already going through a lot every morning and night with this routine. I also love a cleanser I can use while my eyes are open. No tears here! So between you and me, I thought one was supposed to exfoliate at least once a day which is what I had been doing up until a couple weeks ago. Still not completely sure if it's necessarily bad for you to do so, however a good amount to my beauty enthusiast friends is 1-2 times a week. Favorites: NEOGEN Bio Peel Gauze Peeling Green Tea or anything Fig + Yarrow. Why I love: It just feels so throughly clean and really gets the job done as far as removing any and all dead skin off my face. I love toner because it means I can finally stop washing my face after all the cleansing, haha. Other than the fact that it's a great source of hydration after drying your face from all the rinsing, it's a great base (along with Essence) to keep the next products in your routine locked and loaded. Favorites: Son & Park Beauty Water, Mario Badescu Facial Spray with Aloe, Herbs and Rosewater, Mario Badescu Cucumber Cleansing Lotion. Why I love: They're the perfect accompaniment to a perfect cleanse. My skin (although still in need of moisturizer after) looks and feels healthy. It's a beginning to the process of further hydrating my skin. Essence is something really new to me. It's definitely the heart and soul of Korean skincare/beauty so of course I had to do my research and find out which products worked best for my skin. Although I'm really lucky to have normal type skin that I can experiment with, I like to have my staples. Why I love: It smells amazing and honestly doesn't make my face feel too dry like other essences I've tried. I used to be such a serum snob, making sure I was up to date on what specific serums blogs were telling me to purchase each week. Finally I found simple products that work really well with my skin and are actually incredibly affordable. Favorites: Alder New York Everyday Face Serum, The Ordinary "Buffet", and The Ordinary Hyaluronic Acid 2% + B5. What I love: Quick and easy, constant results, keeps new blemishes under control. I CAN'T GET ENOUGH OF SHEET MASKS. At home, in the bathroom, in the kitchen, at the airport, on a plane, when I check my mail. I will wear them ANYWHERE because they're just so good for your skin. Sheet masks just makes your skin feel so smooth, supple and healthy feeling/looking. I'm making one of the drawers in my house a sheet mask drawer and you should too. Get into it! Also heard keeping them in the refrigerator is a cool option too. 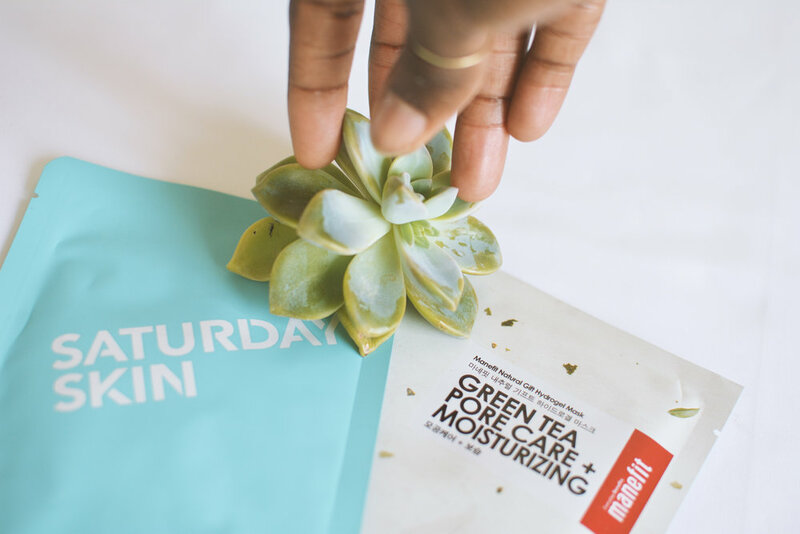 Favorites: Saturday Skin Quench Intense Hydration Mask and Manefit Natural Gift Green Tea Pore Care Sheet Masks. The day I realized I needed eye cream was the day I realized I was officially old. (I use "old" lightly haha). I blame this past election for the designer bags under my eyes. Why I love: A little goes a long way. One pump (maybe not even that much) warmed up on my ring fingers and applied around my under eyes and it gets the job done. For someone with normal type skin, like I said earlier, it's an advantage to be able to experiment with different products and not necessarily have much harming impact on my skin. The only bummer for when it doesn't work out is that the results are on either sides of the extremes. Really oily or really dry. So during those occurrences when I find moisturizers that work for me, I make them a part of the family REAL QUICK. Favorites: Saturday Skin Featherweight Daily Moisturizing Cream, Missha Super Aqua Ultra Water-Full Clear Cream and Kiehl's Ultra Facial Cream. Why I love: Hydrating, Long-lasting, Works well under makeup, doesn't clog my pores. If moisturizers aren't your thing another great option after serums and eye cream is oils. Sometimes when I want a quick reboot in the middle of the day when I'm not wearing makeup or I'm chilling at home a little splash of oil massaged gently into my face literally does the trick. Also remember if you use oils after using moisturizers (like I do some days as well), make sure it's your last step. OILS GO LAST. Favorites: Biossance 100% Squalane Oil, Josie Maran Argan Oil, The Ordinary 100% Organic Cold-Pressed Rose Hip Seed Oil. Why I love: Great alternative to moisturizers (optional), can be added on top of moisturizers.